HR departments have often been accused of lagging behind in using new technology to streamline their processes or make their function more effective. However, new advances in technology are giving rise to tools and applications that can add significant value not only to HR teams but also the employees whose welfare and interests that they manage. This is the first in a series of articles about how technology is enabling HR teams to radically transform the way they operate, thereby enhancing the value HR can add to organisations as a whole. The adoption of algorithm and AI-powered recruitment tools has increased steadily in the past couple of years. One of the most valuable AI applications in the HR space is the automation of the recruitment process. This helps recruiters and hiring managers to eliminate their biggest time wasters – screening candidate CVs and interviewing irrelevant candidates. Some job board statistics show that high-volume job postings can receive as many as 250 applications per position hired – up to one third of which are irrelevant. New automated screening solutions use AI to learn what a good candidate looks like based on past hiring decisions as well as publicly available candidate data. Tools in this space can learn what experience, skills or qualifications are needed and then apply this knowledge to automatically screen, grade, and shortlist candidates – saving the many hours that it would take a person to conduct the process manually. Companies worth noting in the AI recruitment space include ZipRecruiter, a job marketplace which analyses data gathered from past candidate searches and uses this to determine suitability for future job listings. A more recent entrant to the space is Eightfold.ai. Founded by ex-Facebook and Google employees, Eightfold.ai scours the internet for publicly available profile data and predicts which candidates are best for which roles. Several studies have shown that employees hired through referral tend to be a better fit and stay with the company longer than those that are recruited through job boards or recruitment agencies. Hiring the wrong staff results in wasted training budget, decreased productivity and higher attrition. Using employee referral platforms and software to facilitate employee referrals can improve key hiring metrics such as time to hire, cost per hire, employee retention and staff turnover rate. If the company employs good people, the chances are that they know and can recommend more good people. RolePoint and Jobvite are enabling organisations to leverage the networks of their employees for referrals. RolePoint enables organisations to automatically track employee referrals and offer referral bonuses. The system integrates machine learning through Google’s Cloud Job Discovery, allowing employees to search for the best jobs to refer to their circles. Similarly, Jobvite can help turn an organisation’s employees into a powerful internal recruitment tool. Jobvite makes use of employees’ social networks to extend recruitment reach and uses Jobvite’s Publisher feature to publish open positions on social media networks including LinkedIn, Facebook and Twitter. Training staff is a huge cost to any company. Whilst most corporates use a combination of classroom and online training, it is often generic and ‘one size fits all,’ failing to cater for specific and personalised training needs. A key new trend is greater emphasis being placed on self-directed, personalised learning – finding the right content for your specific training needs. The advent of massive open online training courses (MOOCs) and the analytics that come with them, are starting to dramatically change the way corporate training is delivered. In the same way that Amazon can learn what you like and recommend other products, new learning management systems (LMS) are adopting the tech pioneered by MOOCs and can analyse the courses you take and recommend other relevant courses to advance your skills. Established players like Udemy and Coursera are moving into the corporate space, providing analytics for managers to track employee training progress and engagement. Go1, another eLearning platform, provides an interface for businesses to find, book, deliver and track all their training via a subscription model, a kind of Spotify for corporate training. Many SMEs offer health insurance as an employee benefit. However the procurement and management of insurance has proved to be a pain point for many businesses. At the same time, most SMEs do not use HR management software, as this is often prohibitively expensive. Enter Zenefits- a free HR management software tool that also aggregates health insurance options. Zenefits took the HR world by storm- enabling SME HR teams to automate payroll and benefits management whilst attempting to disrupt the bloated and inefficient health insurance broker industry. The service has proved so popular and grown so fast in the US that Zenefits has spawned a large number of similar companies all over the world such as SmartHR in Japan and Bayzat in the UAE. Given that the health insurance industry has very specific rules and regulations in each country, it is likely that the Zenefits model will spread in a hyperlocalised way, with many country and region specific players as opposed to a small number of global giants. Perhaps the most interesting trend of all is the use of tech to measure and manage culture and recognition. Ask any CEO or HR director about culture and they’ll tell you it’s one of the most important things in an organisation. ‘Culture eats strategy for breakfast’ has been a popular maxim in business and HR circles. However, until now, many companies- especially corporates- have been bad at fostering, measuring and maintaining a strong culture and recognising performance. In the past most companies would only conduct an annual employee performance review and opinion survey and try to incorporate the feedback in some rudimentary way. Such an exercise is cursory at best, and often fails to recognise the contributions of junior, less visible team members. New culture and engagement tech platforms are enabling organisations to have a real-time, always-on view of the feelings and thoughts of their employees. This type of constant temperature check helps to create a culture of continuous improvement based on actual feedback, enabling organisations to react quickly to changing sentiment, reassure employees that their opinions are heard and recognise contributions accurately. For example, Culture Amp- an Australian tech firm- offers an employee analytics tool that gathers data from employee engagement surveys and gauges employees’ emotional commitment to the company they work for. The analytics platform then enables management to visualise the results and identify areas that may be causing dissatisfaction. Bonusly, a social recognition tool, enables employees to rate each other’s performance anonymously. Managers can then use this to identify star performers and reward them appropriately with discretionary bonuses or vouchers. As we can see, new tech solutions are impacting all stages of the HR lifecycle. 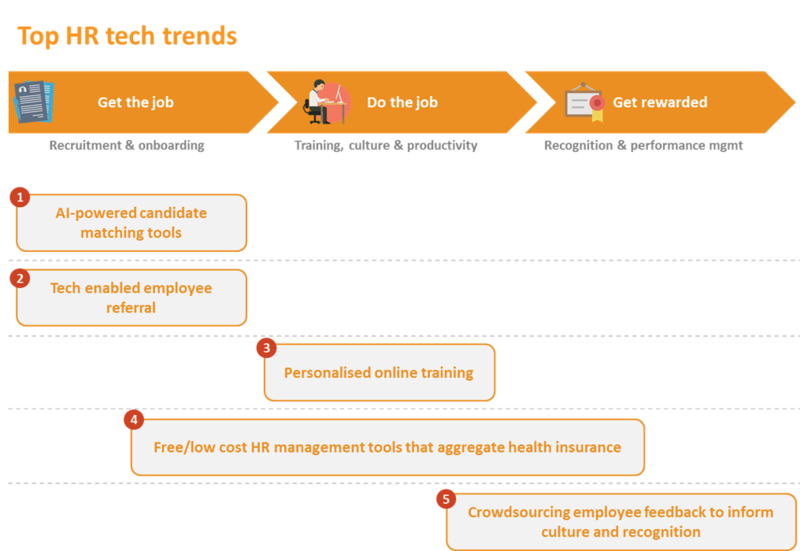 The trends outlined here are by no means exhaustive, but represent some of the key areas of HR tech adoption at the moment. No doubt new HR technologies will emerge in the next year or so, and we’ll be looking out for them.